Vitamin C plays a vital role in promoting good health. Mega C Plus Bioflavonoid is a high strength vitamin C in calcium ascorbate form enriched with bioflavonoids. Bioflavonoids help to increase the absorption and utilization of vitamin C in the body. 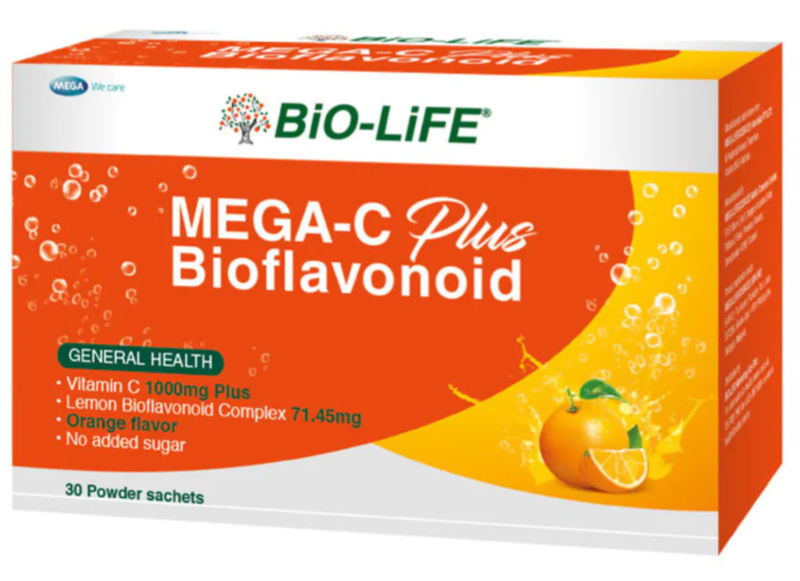 Mega C Plus Bioflavonoid is in ascorbate form, it will be a better choice without irritating your stomach. How does Mega C Plus help? Vitamin C provides antioxidant protection to tissues subjected to high free-radical stress. Vitamin C is specifically required for the activity of human enzymes involved in collagen, hormone, amino acid, and carnitine metabolism. Who need Mega C Plus? Those who want to replenish body’s vitamin C.
Those with gastric issue – sensitive stomach. Traveler – comes in convenient sachet, easy to bring around during travelling. What makes Mega C Plus special?